The starting point for Iacurci’s research is Greco-Roman sculpture, as seen in the practice that originally merged the specific materials of sculpture – marble, bronze, wood or terracotta – with colour, thus creating a single form. Over time, artificial antique taste has in some ways altered this, if not actually erased it, therefore giving rise to an idea of lassicism made of aseptic white marble or monochromatic patinas. Iacurci is fascinated by the reconstructions of the original Greek and Roman works, with their vivid colours and violent, almost psychedelic patterns. With Gypsoteca,the artist wanted to create a contemporary personal catalogue of the old, far from the neoclassicism and monochromy enhanced and codified in the eighteenth century by the visionary Joahnn Joachim Winckelmann. 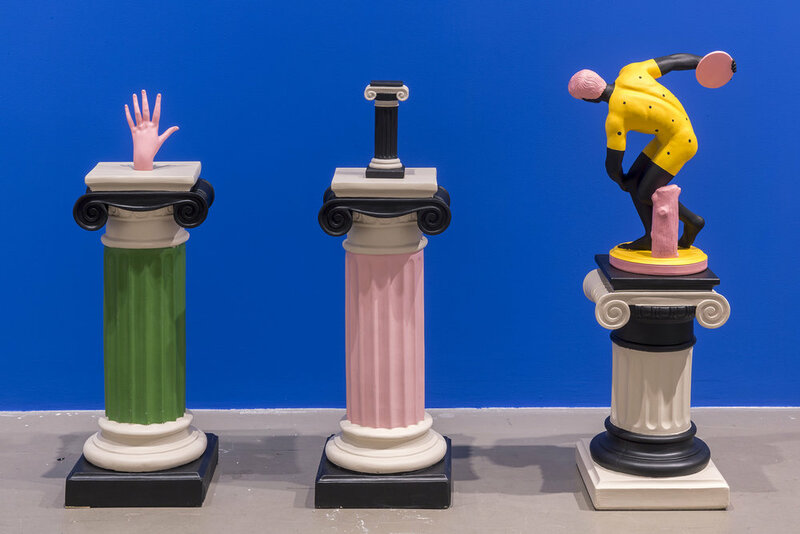 Gypsoteca, a title that explicitly evokes the place where the gypsum models of statues, busts, heads, embossed details and ancient friezes are preserved, is therefore a journey into a parallel universe. It is rich in images and visual inventions, animated by colour. The series of works on show captures the echo of remote yet universal artistic languages. Colour stands out as an archaic symbol and, at the same time, signifies a contemporary reality populated by virtual phantoms to coexist with. The domestic Lares, the ancient Heroes and the Olympian Deities – in bright colours – have found in the paintings of Iacurci the sacred places dedicated to them. And the artist offers them gifts and asks for protection.